Have you had a chance to check out the Initial D Legend 3 movie? For those of you who've seen the final installment of the trilogy, be honest, how do you like it? Did you like the new graphics? How about the new character design? Do you prefer the art style in First Stage from 1998 or this very detailed character design in Legend 3 from 2016? Take Mako and Sayuki for example, they showed up in the last episode of First Stage to watch the final battle between Takumi and Ryosuke. For me personally, it feels more "lively" in the old style. There is a "robotic" feel to this new style. Maybe it just takes some time to get used to it. The racing sequence is purposely "choppy" or "laggy" to convey the impact and shock it gives off. However, it doesn't do it for me. When I compare racing sequence from First Stage and the Legend series, I prefer First Stage for its fluid and fast-pace sequence. Never mind the out-of-date 3DCG, First Stage as a whole just outshine the Legend series in almost every aspect. Do you agree? Leave your comments below! » Screenshot from Initial D First Stage ACT.26「新ダウンヒル伝説!」"The New Downhill Legend!" Image size reduced, original size: 1270 x 1670. Click here to view the image in its original dimension. The racing sequence is purposely "choppy" or "laggy" to convey the impact and shock it gives off. However, it doesn't do it for me. The intent here has nothing to do with "impact and shock" and everything to do with recent attempts at trying to imitate 2D. 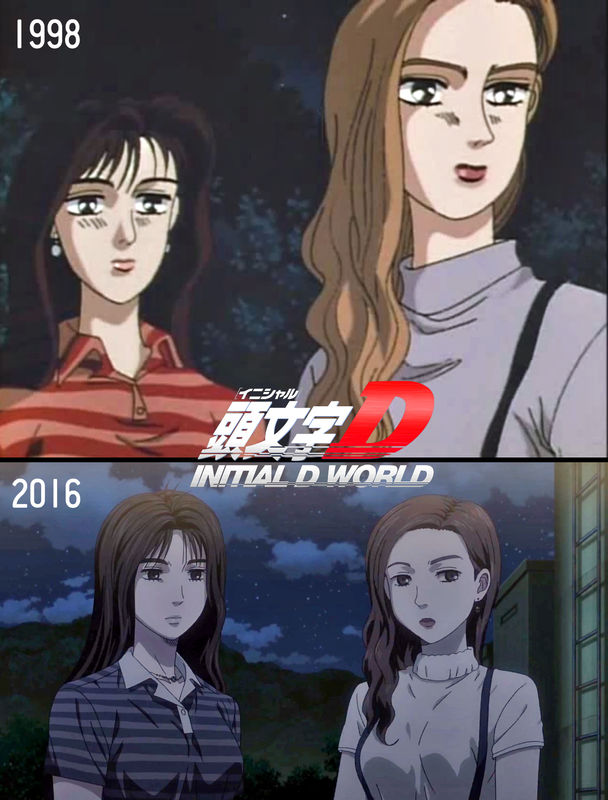 For a while now, some of the 3DCG animators in the anime industry have been trying to ape a 2D look by animating at less than 30fps. But a lot of these animators don't yet fully understand the sense of timing and other tricks 2D animators use to hide choppyness in 2D animation, so a lot of these efforts end up looking less like genuine 2D animation and more like real-time 3D on weak hardware. "3D that looks like 2D" is still really in a very experimental phase, and it generally shows whenever 3D animators attempt it. Sanzigen's 3DCG work on the Legend movies is better than most of these efforts, spectacular in comparison even, but it's still not entirely there. The visual style itself is pretty good - damn near perfect on occasions. There's not much of a clash going on between how the 2D and 3D elements look, and in still shots a lot of the CG can easily pass for 2D. People have pointed out a car interior shot in one of these movies where, if you turn up the brightness, you can see that someone forgot to turn off the wireframe when rendering; and that was pretty much the only thing giving the car interior away as being 3DCG rather than 2D - it was otherwise aping the 2D look that well. As far as still shots are concerned, the 3DCG in these movies is consistently good at what it sets out to do. But once motion comes into the picture, the illusion starts to break on account of the one flaw consistently plaguing this style of CG - in trying to ape 2D by not being too smooth, they forget that 2D itself is always trying to look smooth and/or dynamic, and that 2D animation will look smooth when proper time, money, or talent is involved in making it (the only exception being when a director feels a jarringly choppy look would suit a particular scene better). Either a bunch of clever visual tricks will be used to make less animation look like more, or money will be thrown into inbetween frames until the animation looks smooth enough. The CG doesn't fully nail either approach to 2D animation. Some of the cuts attempt to imitate the look those visual tricks lead to, but there aren't a lot of these; and some of the cuts actually are smooth, but most of them aren't. Instead, a lot of it looks like key frames that didn't get enough inbetween frames to smooth them out, combined with shots that'd demand lots of non-recycled frames to look smooth. The "throw money at it" look would've been trivial with the level of CG employed, but due to the now apparently industry-standard use of excessive choppiness, they unintentionally aped the sort of animation you'd see more in low budget shows (if the animation director for such a show was terrible at coming up with cost-effective shots). It's still way better than some of the other recent 3DCG attempts at 2D, but the end result is that the races look less than half as dynamic as the CG could've realistically allowed for. In fairness, the look is still good enough that it'd have worked perfectly in any other show. It's just that it stops being as perfect when the entire focus is on high-adrenaline races, and when there aren't even that many shots where 3D and 2D elements have to be animated in sync with each other. Basically, if the Legend movies had been done a few years from now, where 3DCG animation would have finally evolved past this experimental phase and better learned what makes the 2D look work (or at least learned not to overdo the choppiness when faking the limited-animation approach to 2D), choppiness of this level simply wouldn't be present at all, and the animation would've been far more dynamic. I think the character models look much better now. Keisuke is so much more handsome! Mako got a good upgrade, Sayuki.... eh. Hope they still have the 'jiggle' scene. I love the new animation style. Wish they would re-do stage 1-4 in this style and quality! Well, the end of Legend 3 hints at the possibility of more movies, so there's hope for that. Wow! Really? I haven't watched the movie yet, but that would be awesome! Thanks for letting me know by the way!